The warm and gentle Christmas love story that inspired The Shop Around the Corner, She Loves Me and You've Got Mail, Perfumerie centers on feuding employees who have each fallen in love with their secret pen pal. What will happen on Christmas Eve when they discover their lover's true identity? 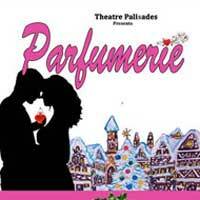 Find out for yourself when Parfumerie comes to the stage of Theatre Palisades this holiday season. "...Unfortunately, even though George realizes that Amalia is his secret love, he does not reveal the truth to her until Christmas Eve, more than two hours into the play, which of course leads to a happy resolution in this very old-fashioned, romantic Christmas tale. That tender scene, however, was disrupted by some very loud chatter in the theater lobby which could be heard clearly over the play dialogue from where I was seated in the theater, ruining probably the most heartfelt scene in the play that I had been anxiously awaiting to occur."